You don’t need a fancy kitchen to excel as an everyday French chef. But there are some basic items of equipment that are useful, and others that are essential. 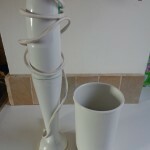 What follows is a photo catalogue of the main pieces of equipment in my kitchen. 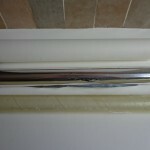 Take a look, and if you find there’s an item missing from your kitchen, consider investing in it. Good equipment can make all the difference. Every kitchen needs a good array of knives, and a good sharpener. 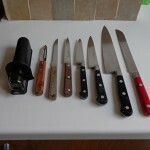 From left: knife sharpener, peeler, small serrated knife, stainless steel knives of various sizes, bread knife. 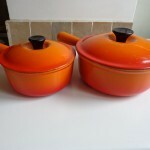 Two cast-iron pots with enamel interiors. I bought them years ago and have never regretted the expense. 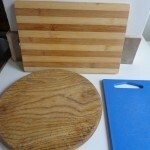 Perfect for making everything from pan-seared scallops to sauté de veau. 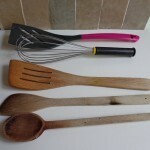 A wooden spoon, two wooden spatulas, a wire whip and a plastic spatula/flipper. The wooden spatula second from bottom is my main kitchen tool, in use every day. 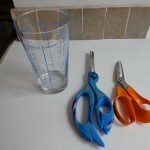 Two pairs of kitchen scissors and a glass measuring cup with metric measurements. It allows you to measure different products — flour, sugar, etc. — by weight in grams, and liquids by fractions of a liter. 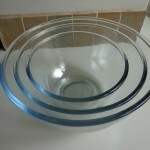 … as are mixing bowls. My American measuring cup and small tools that make a difference. 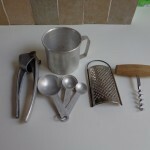 From left: garlic press, measuring spoons, nutmeg grater, corkscrew. No modern kitchen should be without a steamer, perfect for cooking veggies and fish, and for reheating rice, couscous and purées. I use mine every day. Three enamel saucepans of varying sizes, and a sieve — useful for draining veggies, straining broth, sieving flour and sprinkling powdered icing sugar over cakes and tarts. 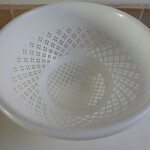 A colander — for rinsing fruit and vegetables, draining spaghetti, cleaning mushrooms or mussels, etc. A great all-around tool. 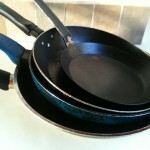 Frying pans of various sizes. The top one is a small French crêpe pan. My favorite all-purpose pot. 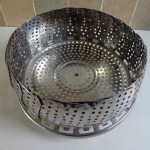 It’s good to have a couple of these in different sizes — for soups and stews, for use with the steamer, and for pretty much anything you can make on the stove top. Porcelain gratin dishes (also useful for roasting anything from veggies and fish to poultry or fruit. 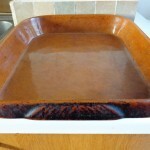 An earthenware roasting pan, which I greatly prefer to the glass or metal variety. It roasts beautifully, acquiring a patina over the years, and is superbly easy to clean. 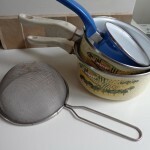 A four-sided grater and a soufflé dish. 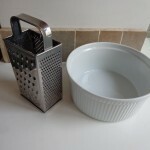 I only use two sides of the grater, the two pictured here (fine holes and medium holes). The third side, for grating parmesan, is hard to clean, so I use the side with fine holes. Works brilliantly. A hand-blender, useful for making soups, purées and sauces like pesto. What would life be like without an electric mixer? 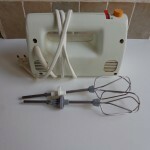 For whipping cream or egg whites, or whipping up a cake. 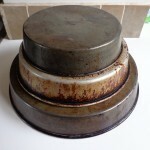 Cake tins of various sizes, inverted to show how they can make a three-tiered cake. 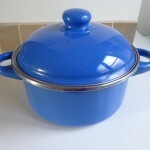 As you can see, I use these tins not just for cakes but also for heating food in the oven and roasting poultry and meat. A fluted ring mold, known in France as a kouglof tin, and a French bread tin, used also for sweet and savory loaf cakes. 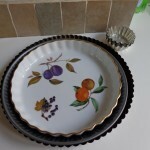 Pie plates of various sizes for tarts and quiches. 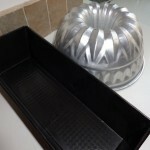 The top one, of porcelain, allows for lovely presentation, as does the bottom one, a French tarte pan with a removable rim. 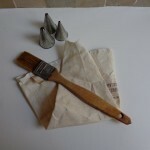 A pastry brush, useful for savory dishes too, and a pastry bag with three tips for cake decoration. Plastic wrap, aluminum foil and, at top, parchment paper — a relatively new discovery for me, and incredibly useful in baking. I have just moved to a new (old home) with a kitchen that I love. I am finding that I have way to many kitchen items. Your list helped me think about what to keep and what to share with others. The one thing that I will put on my list that I do not see on yours is a LARGE stock pot for making frogmore stew/lowcountry boil and steaming crawfish and crabs. Yes I am from the southern part of the U.S. I am enjoying your blog.